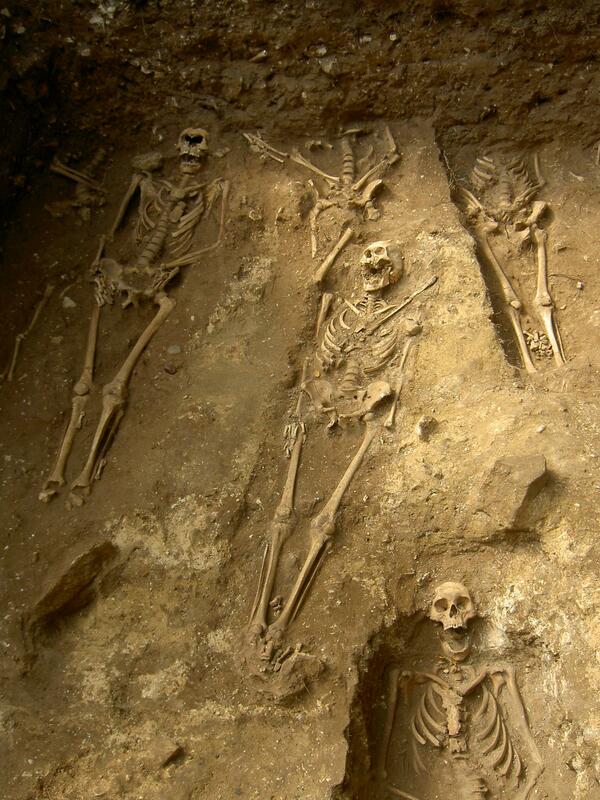 Oxford Brookes University is playing host to a new one day introductory human osteology course in 2014. The course is due to run on the 11th of April 2014 and will be staffed by the former knowledgeable organisers of the University of Sheffield human osteology short courses. The price of attending the one day event costs £120 falling to £100 for concessions and can be booked through the Oxford Brookes shop here. For anyone that is interested have questions to ask, or simply wish to engage with the course providers, they are advised to head over to and join the friendly Facebook group for updates. It is hoped that this one day course will lead to further short courses in human osteology at Oxford Brookes University. I will update this when more information becomes available, although there are hopes a five day long course will run after the one day event. 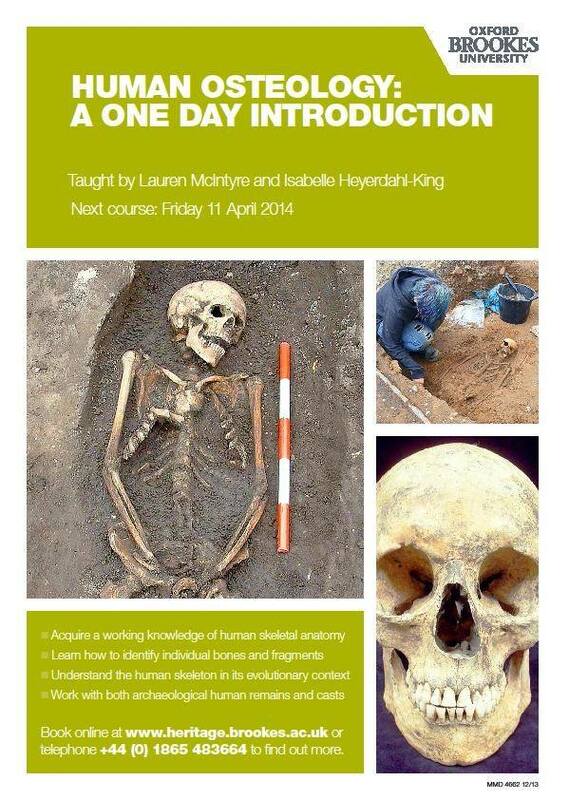 The poster for the Human Osteology short course at Oxford Brookes University in April 2014 (click to enlarge). In other news the University of Sheffield is still running its own human osteology short courses. The next installment of the 3 day long course runs from the 10th to the 12th of April 2014 and costs £180 to attend (£120 for concessions). The course will be delivered by Dr Diana Mahoney Swales and Lizzy Craig-Atkins, both For further information or to book a place please contact Dr Lizzy Craig-Atkins at e.craig-atkins@sheffield.ac.uk or join the Archaeology at the University of Sheffield Facebook page for updates. Further to the above two courses Bournemouth University are also offering a 3 day human osteology short course in April 2014. The course runs from 29th of April until the 1st of May and it is priced at £300 to attend (with a 10% discount for BU alumni or students). 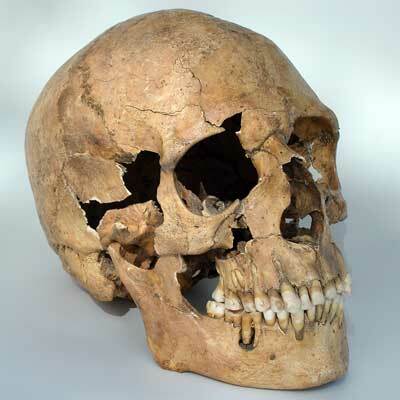 Importantly this course highlights both the archaeological and forensic value of human remains, with both ancient and modern populations and case studies being considered and studied in this short course. Bournemouth University has a well respected and dedicated laboratory for studying the remains of archaeological skeletal remains. It has also come to my attention that Luton Museum is holding a 1 day course in advanced practical human osteology on the 21st of June. The cost to attend this day long course is £75 and it includes a free meal. The Luton Museum team regularly run human osteology events and has been a regional store for human remains for 80 years, it is also expected that information on further courses to appear at the Luton Museum website for future events. The Luton course is ran by Dr David Klingle, a human osteology associated with the University of Oxford, and Tim Vickers, the collections care officer at the museum. All four of the intensive courses detailed above are open to anybody who is interested in acquiring knowledge of human skeletal anatomy and are taught by professional human osteologists. The participant will get to learn new skills, utilize the knowledge of the practitioners and apply the skills learnt when studying actual archaeological human skeletal material. I for one have attended the university of Sheffield’s short course previously, before I proceeded onto the MSc in Human Osteology and Funerary Archaeology, and I found the course invaluable. If you are curious about human skeletal remains in the archaeological record and want to find out exactly what they are used for and what you can tell from them, then plunge right in and join a course! A chance to get face to face with humanity’s past. If you have always been interested in the human skeletal and want to develop this further, then take a look at my earlier post on human osteology courses in the UK at the Masters level. Furthermore if you know of any other short courses in the UK please comment below or send me an email and I will add it to the list here and to my UK human osteology blog entry. Bournemouth University short course page. Oxford Brookes University short course page. University of Sheffield short course page. Luton Museum short course page.